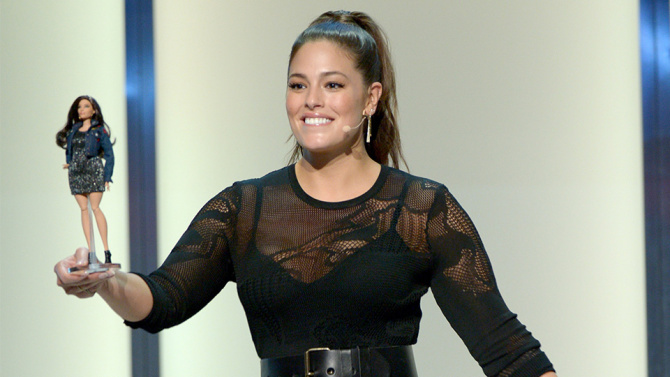 Ashley Graham, queen of the makeup-free selfie and pioneer of #thickthighssavelives moment, had a pinch-me moment last night when she was presented with her very own Barbie at Glamour‘s Women of the Year summit in LA. Like Graham, the Mattel toy’s got curves — and yes, her thighs touch. The doll, whose eyebrows aren’t bleached (whatever), is wearing an sparkly body dress from Opening Ceremony, a denim jacket from Sonia Rykiel, and Pierre Hardy boots. And although it’s not available for purchase as it’s one-of-a-kind, Mattel has expanded its offerings to include a range of body types and skin colors. As it turns out, it’s not that hard to be inclusive.